The Indigenous People of Biafra (IPOB), has again unmistakably demonstrated to the global community, the level of disdain they have for the so-called Nigeria Restructuring Summit held in Awka, Anambra state on Monday 21st May, 2018. Prior to this fraudulent event, the leadership of the IPOB, through it's Media and Publicity Secretary, Comrade Emma Powerful, pointedly warned that Biafrans would not allow any form of anti-people summit to hold anywhere within Biafraland, to further the enslavement policy of the powers that be. Family Writers Press Correspondents who covered the event from Ekwueme Square, being the Summit venue, reported that the Nigerian armed forces which included Soldiers and Policemen, violently descended on the family members of the Indigenous People of Biafra (IPOB). They were reportedly identified in the event venue, with scores terribly wounded and others arrested before the summit commenced. However, the IPOB women who were specifically detailed with an assignment, maturedly maintained calmness in the face of diversities of provocative treatments being carried out against the IPOB youths by the security agencies. Then came the much awaited time of the saboteur-in-chief and the President of the infamous Ohaneze Ndigbo group, Nnia Nwodo, to mount the podium for his own speech before his guests in the summit. There arose the resilient and courageous IPOB women who unanimously voiced out a deafening rejection to all that Nnia Nwodo was struggling so hard to dish out to the public. This action of the IPOB women brought the summit to a shamefully abrupt end as they vowed and stood their ground even in the presence of armed security operatives, never to allow any other speaker access to the podium for further speeches. People who converged for the delusional restructuring summit, started thronging out of the venue, for their safety, following the chaotic situation and frustration. 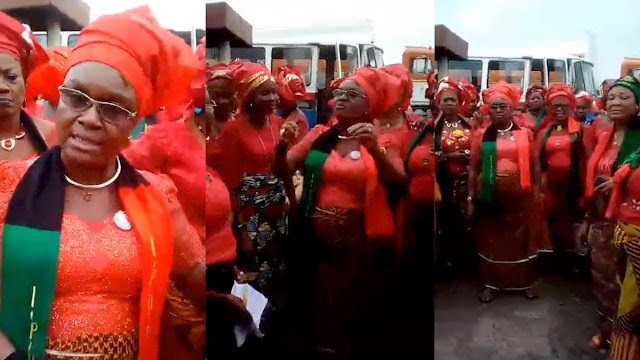 The women of the Indigenous People of Biafra (IPOB), insisted that Biafra referendum must be conducted for the unfettered restoration of the Independence and Sovereign Nation of Biafra as collectively and unequivocally being demanded by the people. The old monster and chief saboteur of the people, having realized his fruitless and disgraceful venture as the frustrated and disappointedmasses kept thronging out of the Alex Ekwueme Square, took to his heels. Other Biafrans who openly supported the action of the IPOB women, equally joined in the fray.